Naked mole rats are unusual in many ways as a result of adaptations to living underground, with extreme longevity and a lack of the normal signs of ageing. Their resistance to cancer has been linked to the production of a substance called high molecular mass hyaluronan (HMM-HA), and mutations in the HAS2 gene that produces it. The researchers from Queen Mary University of London sequenced the HAS2 gene in thirteen similar or related mammals, combining the data with DNA sequences extracted from 57 published genomes representing all the major mammal groups. 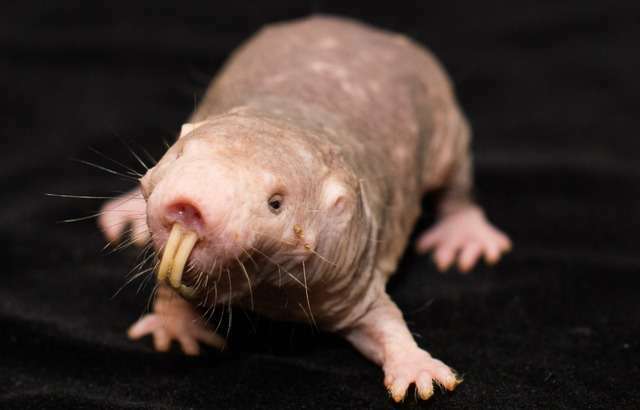 They found that while all African mole rats share some mutations in the HAS2 gene, the naked mole-rat has a unique combination. Dr Chris Faulkes, lead author of the paper, said, "While naked moles-rats are extreme in many aspects of their biology, we predicted that we would see similar molecular adaptations in the HAS2 gene in other mole-rats and subterranean mammals, yet they remain unique even among other mole-rats within the family." "However, our study has identified a number of other HAS2 gene mutations that are predicted to have a significant effect on hyaluronan production, opening up exciting new avenues of research into the pathways whereby HMM-HA prevents tumour formation."